We’ve uploaded a pre-release to the “pre” branch. It’s mostly feature complete, but there are still a few bugs left to fix, and it’s still missing a few graphics. Remember, always use a separate installation for preview builds as they may potentially include game-breaking issues. As mentioned in a previous dev blog, we’ve completely rewritten the chunk request system. The new approach streamlines the order of chunk requests over multiple entities. They’re now ordered in the background on a global level, meaning nearby chunks will have much shorter load times. This also benefits the lighting calculations, which should improve overall performance. A new graphical effects that outlines/highlights entire entities or groups. Right now we only use it for the current selected target and for most C + V systems out there. Most likely we’ll integrate this system later with the upcoming power changes and its information warfare portion. The outline system uses a highly optimized mesh that can quickly be generated for any number of blocks. Although this system is not able to replace the existing mesh and chunk system due to lacking information, they’re still a necessity for future plans as they would also be used in far-aways LoD views of a model. In combination with higher-granularity chunk system, should give a large FPS increase when viewing bigger objects in the distance. This is an addition to the build helpers. You set two points (using your camera position, as with the fill tool) and it will create a line between them. You can adapt the line thickness with a slider. We’ll add more features in the future, such as splines. As with the new GUI, this is also a work-in-progress, so we’ll be improving it and fixing any issues that arise. The fill tool allows you to incrementally fill (or replace) areas with your desired block. It’s quite simple to use: you can freely select your starting point with the camera (similar to ‘create docking’), and press the fill button with a block selected on your hotbar. The fill tool allows both space-filling and block-replacing, depending on what the starting point is. If it’s empty space, the tool will flood-fill; if it’s a block, only that block type will be replaced. Also: this is a step-based system, meaning undo and redo work, allowing you to easily fix any mistakes. You can use the slider to set the amount of blocks added by step. The max amount can be changed in the config. With adding the line tool, we added a new way to select portions of blocks altogether. It is now possible to select boxes by selecting the starting and the end point. This comes in especially useful for copy & paste which in the past always was a bit finicky to use. Besides the new look, we’ve changed quite a lot of the original’s build mode functionality. We’ve grouped the available tools together accordingly and those groups can be collapsed or expanded when needed. When the expanded areas become too large, it becomes scrollable. However, the orientation group with the undo/redo buttons however is fixed at the top so that you never lose track of it. Which group is expanded or closed is saved on exit and restored next session. 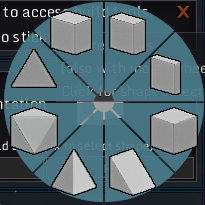 The orientation group at the top also functions as a radial menu for shape selection, simply left click it and hold to make it popup. The sliders have received a makeover, now allowing more ways for you to change their value. Their value can now be entered manually by left clicking the value on the left side and functions like a text box only allowing numeric input. If you have a mouse wheel, you can also change the slider’s value by hovering your mouse over the textbox on the left and scrolling up or down, allowing for quick adjustments. The placement of the build helper can also be moved independently without having to clear the current build helper. Symmetry planes now have their individual odd-mode, allowing you to work with an off-center XZ plane but a centered YZ plane at the same time for example. We’ve also added tooltip support to the build mode panel. It’s not used that much right now but later we can add some nice descriptions to some of the tools if needed. Additionally we added “sticky advanced build mode” by pressing the advanced build mode key twice rapidly, which allows you to keep advanced build mode active without having to hold the key. Pressing the key once more gets it back to normal. You connect a storage to your rail docker on a ship, and dock it to a Load Rail on a station. The ship is then able to pull items from any storage on the station connected to that Load Rail. If you instead dock the ship to a Rail Unload block, the station may then pull items from the ship’s connected storage to any storages connected to that Rail Unload block. Again, both docker and rail need active connected storages. Also, the station will only pull items if it has permission to do so! ~ ECMStrengthMod: BlockBehavior option that modifiers the amount of scanner modules needed versus mass of target ship to disable cloakers/jammers. Additional to the features we described above, this version also already contains the foundations for a lot of other bigger features to come, which aren’t finished yet. However, this is the main reason for this pre-release to have taken longer, following up on our promise to strive for quality instead of quantity. Look out for the next dev blog which will contain the first part of our end-game documents. ~ T2403 & T22: flip-flop and NOT signals not working properly with rail switching. We’ve also added more translations to the game and all of the typo fixes that were brought up by our hard working translators!